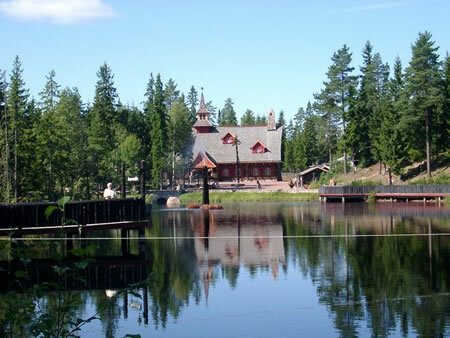 If you want to explore the beautiful surroundings of Siljan the camping is located just right. Here is a few of the places of interest you shouldn´t miss when you visit us. Santa land, 5 km on the other side of the lake, an exciting place for the little ones. In Mora, 15 km away you will find both the Vasa- and the Zornmuseeúm. Summerland the adventure, in Leksand 50 km away. If you want to go on and have more adventures there is summer rodel in Rättvik, 50 km away. Orsa Grönklitt and the bearpark is also 50 km away. Tällberg, known for it´s many hotels and old buildings is located between Leksand and Rättvik. Sollerö native place farm is well worth a visit. One of the things they offer is a walking road with much culture and a rather scary history experience in the form of a walking road. Or why not pack a picnicbasket and experience the beatiful view from the top of Gesunda mountain. During the larger part of the summer they run the lift up to the top. This was only a few example of what the neighborhood have to offer. You can get more information from Siljan tourism. During summer season there is a touristagency in the centre of the island of Sollerön.